The aim of the project is to build detector to help people avoid any obstacle when they walk on the street. It will give a signal when anything come closer to the user. Inspired by forward collision warning system in a cars, this project is intended to provide added safety to users in multiple situations. 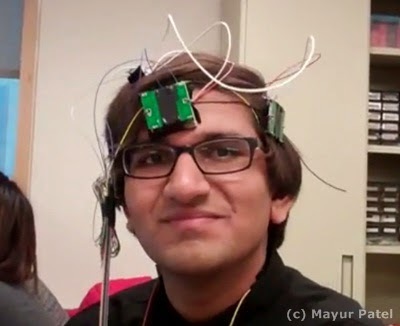 This Personal collision detector designed by Mayur Patel. It uses Doppler radar sensors in order to provide the user with movement, speed, and distance information of their environment. An array of Doppler radar sensors are placed on the user's head and vibration motors are placed on the user's chest, neck, back, and/or arms in order to provide input to the user without impeding any of their other senses. The project uses AVR microcontroller, ATmega1284P, as main controller and four HB100 Miniature Microwave Motion Sensor. HB100 Sensor is a X-Band Bi-Static Doppler transceiver module. It has a built-in Dielectric Resonator Oscillator (DRO) and a pair of Microstrip patch antenna array, making it ideal for usage in motion detection equipment. Four vibration motor is used to give signal / warning to user. When something moves within about 25 feet of the user, the corresponding vibration motor for the particular direction relative to the user where the movement was detected will activate with a certain intensity to indicate how far away the movement was detected. In cases where an object is moving rapidly towards the user at a high speed, an emergency notification is sent such that all motors are activated and will pulse, while the motor corresponding with the direction the danger is in will be continuous and at a higher intensity to alert the user to where the danger is. This project can provide added comfort and safety to users walking at night by alerting them towards anything they may not be able to see. In addition, when walking on the street, this can alert users of bicyclists or electric vehicles coming from behind that they might have not noticed. It can also be used for those who have visual or audio impairment by provided extra information about their surroundings to improve their safety and comfort. For example, this project also allows users to be able to detect that they are walking towards an object like a wall, and can help avoid walking users from colliding into things.